We are one of the renowned manufacturers and suppliers of world class Manual and Battery Operated Stackers, Battery Operated Four Clip, Motor Controllers, Battery and Hand Operated Pallet. These products are manufactured using best quality of raw material and best equipments. They further go for quality checking by our able quality inspectors. Our products are known for their durability, safe operations and resistance to corrosion and abrasion. 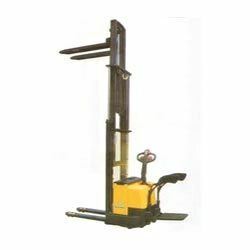 We have gained a great level of expertise in the field of manufacturing and selling Electric Stacker. With the help of our excellent staff, we are able to manufacture finest quality of Stackers. These are basically used for Bulk Material Handling Operations and Intensive Multi shift Operations. They are known for their durability, pollution free functioning, capacity of bearing heavy loads, safe operations and resistance to rust, scratches or wear. Our products meet the industry standards and are highly appreciated by our esteem clients. The Manual Stalkers that we manufacturer and supplier of high performance machines. These stalkers are widely appreciated by our clients. They posses critical features like corrosion resistance, minimal maintenance, durability, and are also leakage free in nature. They find their application in bulk material handling operations. It helps to pile bulk material onto a stockpile. 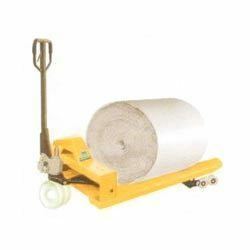 The Hand Pallet Trucks manufactured and supplied by us are used as storage aids for manual tasks over short distances. 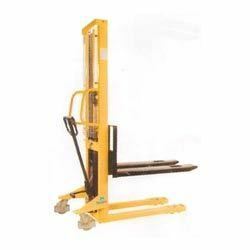 They are capable of handling pallet loads upto 2500 kg. We have special models for picking up loaded pallets in just 5 strokes, they also have 50 mm ground clearance. Apart from being durable, safe, robust, economical, pollution free and corrosion resistant, the machine also come with following specifications. 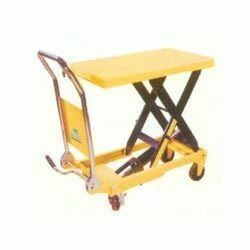 We are one of the prominent manufacturers and suppliers of quality manual Scissor Lift Table. Our manual scissor lift table has the latest design of scissor structure and safety of the operator is ensured by an overload valve and mechanical stopping devices. You can stop the lifting and lowering at any position without any threat to the safety and stability.